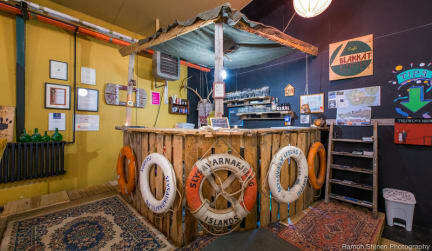 The Freezer Hostel & Culture Centre is a multi award winning establishment that mixes hosting travellers with offering entertainment and space for meeting people in our huge lounge / tikibar. The hostel has 4 dormitories and space for 22 in all, a fully equipped kitchen and shared bathrooms. This one of a kind hostel also offers free parking, book exchange, plenty of board games, tourist info and maps. Happy hour is every night from 18-20. Linen is always included in our price. On top of this, The Freezer regularly programmes events such as theatre, stand up comedy, live music, pub quizzes or karaoke nights. Cancellation policy: 24h before arrival date. In case of a late cancellation or no show, you will be charged the first night of your stay. Check in from 17:00 to 21:00 . Reception is open from 17:00 - 21.00 everyday, for early or late arrivals please let us know at least 24 hours in advance. Great hostel! Would definitely recommend. Clean, comfortable space with friendly staff! Best hostel I've stayed at. Very unique and very homely. The way the common room is decorated makes it feel extremely comfortable and encourages you to meet people. The staff are very friendly and accommodating. Part of the great atmosphere of this hostel is due to their easy-going nature as well. It feels like they are one of us! There were musicians performing a show for us after dinner. Great way to chill out after a long day. Bed and bathrooms are clean and comfortable as well! Great places ! It's also a cultural center with a nice louge area. You can easily meet people there. However, only two WC/shower and rooms are really close to the kitchen, it's can be a bit noisy in the morning. I loved this place. Super Friendly and helpful Staff. Loved the Music at Night. The owner preformed the night I was there. He was funny and played the acoustic guitar and sang too. Very Good at both. Excellent industrial location thats close to beautiful scenery & away from the madness. Thinking about going back for New Year's. Very enticing!! Thanks Freezer for a memorable stay!! When I was staying I was one of only two guests, but the lounge space looks well set up for meeting other travelers, with a bar and couches. The location is great is a great place to stay overnight if you’re doing a road trip. We traveled in the off-season, so there wasn't quite the atmosphere the website and listing promised, but still a really nice, cozy place. Staff was really friendly and helpful (there was bad weather, so we got advice on the safest driving routes and attractions), but we couldn't quite figure out when they were present. There were only two combined bathrooms/showers, so there was a line in the morning, but the hostel isn't that big, so it wasn't too big a problem. Great looking place. We went during low season a just right after a storm. But the look and feel of the hotel is funky yet cozy. We had a good time there. I went during a low season, so I don't think I can speak much on the social atmosphere of this place. I can say that the location is great for those staying overnight while exploring the peninsula - located in a very cute fishing town. The staff was very friendly and helpful. Rooms and bathrooms were clean and comfortable. The security was questionable - you aren't given a key for the building or your room (also I didn't see any lockers) so really anyone could get in, but I didn't feel unsafe. Staff not very engaged and kitchen very ill equipped. Design of the hostel was decent but let down somewhat by the atmosphere.